Background: Aging or senescence is a complex biological phenomenon. Artificially selected Drosophila for extended longevity is one of the experimental models used to understand the mechanisms involved in aging and to test various theories. 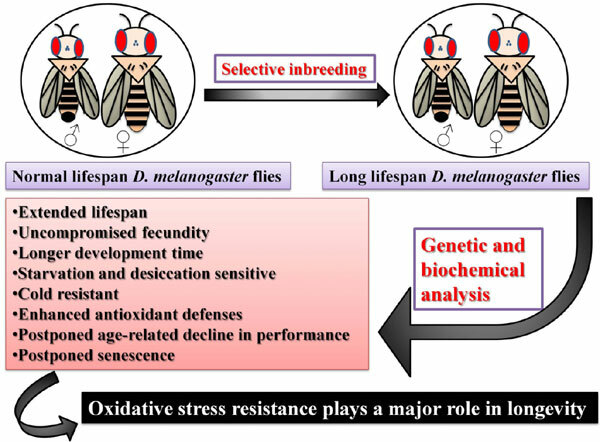 Objective: To examine the life history traits and biochemical defenses in relation to aging in an extended longevity phenotype of Drosophila melanogaster. Methods: Life history traits viz., survivability, fecundity, development time, dry weight, wing size, lipid content, starvation, desiccation and cold resistances, locomotory ability, antioxidant enzyme activities and reactive oxygen species level between control and selected lines of D. melanogaster were investigated. Results: In our model of Drosophila, extended longevity is associated with no trade-off in fecundity and shows variable resistance to environmental stress such as starvation, cold and desiccation. Enhanced biochemical defense involving the antioxidant enzymes was positively correlated with longevity. Conclusion: Extended longevity phenotypes of Drosophila represent genomic plasticity associated with variable life history traits attributed to the genetic background of the progenitor population and the environment of selection. Oxidative stress resistance seems to be a significant factor in longevity. Keywords: Longevity, fecundity, stress resistance, aging, antioxidant enzyme defenses, extended lifespan. Keywords:Longevity, fecundity, stress resistance, aging, antioxidant enzyme defenses, extended lifespan. Abstract:Background: Aging or senescence is a complex biological phenomenon. Artificially selected Drosophila for extended longevity is one of the experimental models used to understand the mechanisms involved in aging and to test various theories.